i’ll tell ya what…if you play any form of acoustic slide guitar – whether it be conventional blues acoustic guitar, wood or metal bodied resonator, or a weissenborn hawaiian guitar (like the one pictured here), then hopefully you’ve discovered what a treasure ribbon mics are by now. if you haven’t, then by all means insist on one the next time you find yourself in a studio that can accomodate your request. the absolute best results i’ve ever gotten were using an RCA 77DX through a UA solo 610 preamp, but i’ve gotten great results out of the coles ribbons as well. even the budget shinybox ribbon mics get great results, because they don’t react poorly to the unflattering frequencies that are all too common with instruments played with glass or metal slides. 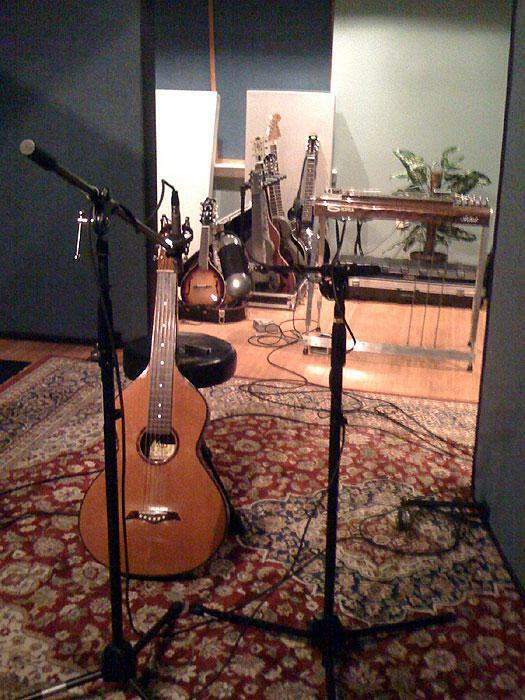 for this session, we cut mandolin on one track, pedal steel on one, and we used the weissenborn on one, as well…and jim salamone at cambridge set up the mic configuration seen in the picture for the instrument, with the ribbon on the neck side of the instrument and the condenser on the body side. it sounded scary good. so good, in fact, that jim suggested that the next time we’re in and i have that instrument along, we should record some solo instrumental pieces “for shits and giggles”. jim’s new room, by the way, is phenomenal. jim’s an easy guy to work with, and the new studio is very condusive to creativity. by all means, check ’em out.